What is abiding? Abiding in Christ, as we have often said, is the opposite of abiding in ourselves. To abide in ourselves is simply to try to do this living, and this working for the Lord, of ourselves; asking the Lord to help us to do it, instead of recognizing that a Life wholly pleasing to God has been lived and that faith appropriates that accomplishment in Christ. Abiding in Christ is simply doing everything, meeting everything as out from Christ. It is a sure ground. There is no need for question and reasoning: "Can it be done? Can I do it?" Or, "I am not sure about it." It is done. The Lord Jesus has met everything that you or I will meet, and in all things has done what is needful. That is available to faith, and faith says, "Well, in myself the thing would be absurd, and to attempt the thing would be ridiculous; as to myself it would be folly to contemplate it. 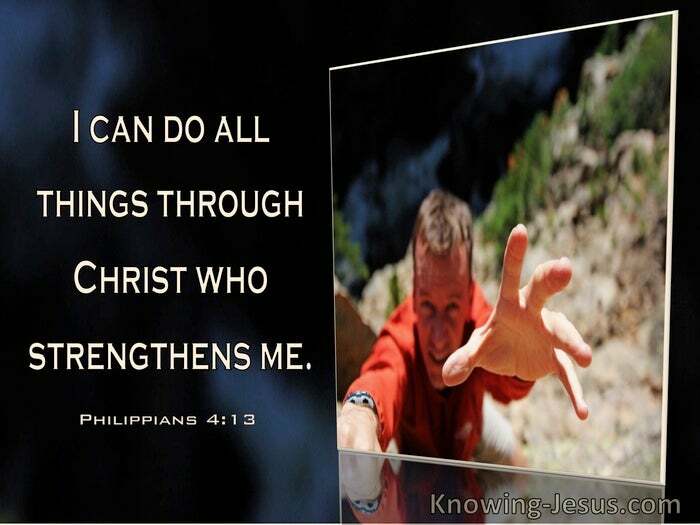 But it can be done, because it is done; I can meet this demand, and I can stand up to that one; I can go through with this, and I can do that –for 'I can do all things ("all" is a big word) I can do all things through Christ, which strengtheneth me.'" It is what Christ is as our secret source of strength, of sustenance, of nourishment. This is a school, and we learn this lesson in a progressive way. He learned, and we learn, though in our case there is a difference to be noted. We are learning to draw upon the fullness which He consummated, working out from a fullness as we press on to the goal. We are learning how to come back to a fullness, He moved on towards a fullness. The Cross for Him was the end, for us it is the beginning. We have to learn how to come back to His fullness and we learn progressively, step by step, like little children, first of all learning to walk and to talk. Like them we are confronted with things which we have never done or even attempted before, things which are all new and strange; a new world, sometimes a very terrible world. The contemplation of taking his first step to a little child is a most terrifying proposition. You and I are brought into this realm of faith, wherein the simplest thing at the beginning, the taking of the first step, is sometimes fraught with horror for us. But there are arms stretched out, and those arms now represent for us the accomplishment of what is required of us, the thing is done. The strength is there, available for the matter in hand, a strength which has been proved. Recognizing those arms and trusting, taking the step, we learn to walk by Christ, to live by Christ; and the next time we shall be able to go a bit further. Each time capacity is being enlarged and we are coming to a fuller measure of maturity.